HABIT: Beautiful white or pink-tinged flowers in spring, sizes vary from small to huge and showy. Full, rounded shrubs with a variety of leaf and flower sizes. Some are open-growing. Deciduous viburnums are the most cold hardy, evergreens are the most sensitive and are best used in the southern half of the state. V. ‘Blancho’ is a small-leafed cultivar. CULTURE: Grows best in well-prepared, healthy soil. USES: Background, screen, spring color, cut flowers. PROBLEMS: Very few, should be used more. NOTES: V. macrocephalum is the more showy blooming Chinese snowball. V. burkwoodii is an excellent semi evergreen with gorgeous spring flowers. 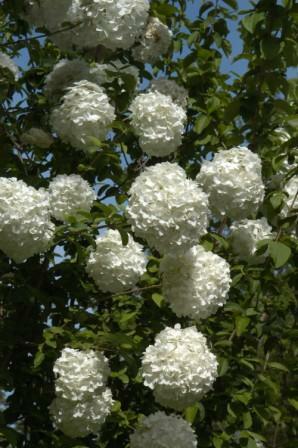 V. caricephalum is the fragrant viburnum. ‘Spring Bouquet’ is a smaller evergreen cultivar. Viburnum plicatum var. tomentosum ‘Doublefile’ is a gorgeous dogwood-like small tree.